On Aug. 25, 2017, Hurricane Harvey swept through Southeast Texas devastating everything and everyone in its path. As one of the strongest storms to hit the U.S. in 12 years, the damage and rainfall left thousands homeless and businesses destroyed. While many sat glued to their TVs watching the powerful storm sweep across communities in Texas, for Enterprise employees in Houston – the storm was a reality they couldn’t escape – and made a lasting impact they will never forget. In part one of this two-part series, we’ll explore how the Houston Group – although faced with hardship and adversity – picked up the pieces and ultimately become stronger in the end. As the storm approached, the Group set up daily calls with the rental teams to determine when and where they were going to move cars and how they were going to get them there. Through close conversations with senior leaders across the Group, vehicles and employees from impacted locations were moved to safety where they awaited the passing of the storm. It was a waiting game longer than anyone anticipated, as Harvey stalled and deluged the region. Once the rain stopped, it was time to assess the damage. Initially, Hurricane Harvey forced the Group to close more than half of its 185 neighborhood and airport car rental locations in the Houston area. Approximately 3,000 vehicles were destroyed in the flooding – just over 10 percent of its fleet. In total, 43 branches were damaged, four of which will need to be rebuilt. Within four days, 75 percent of locations were back up and running, assisting first responders and insurance replacement customers. To replenish the Group’s fleet and meet spiking demand, more than 17,000 vehicles made their way from cities across the country. Several car carrier convoys came in from Austin, Dallas, Oklahoma City, Denver, St. Louis and Birmingham. In addition, 500 units were loaded on rail cars from as far away as California. To assist one of the hardest hit areas, the Mobile Emergency Response Vehicle (MERV) was delivered to the Meyerland community of Southwest Houston. MERV operates as a portable, state-of-the-art branch office in the event of an emergency. It can operate on a generator for more than 120 hours, supporting relief efforts even before local power is restored. Tablets also played a critical role during this time. 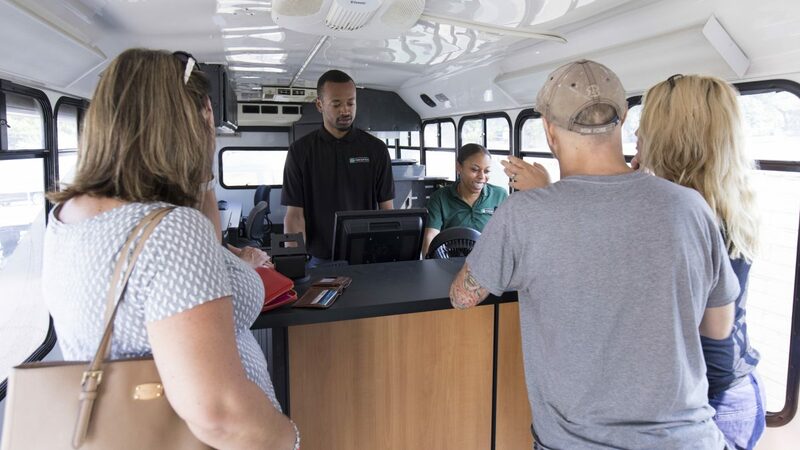 The team also collaborated with the Federal Emergency Management Agency (FEMA), General Services Administration (GSA), State of Texas, Texas Army National Guard and others to help determine the most pressing and urgent transportation needs in Southeast Texas. As Houston and the surrounding communities start to rebuild, one thing stands apart in helping Enterprise quickly get back on its feet: its people.